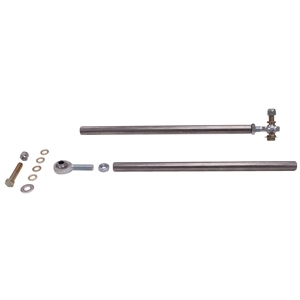 Tie-rod tubes are designed to replace the stock Pinto-rack tie rod with 5/8"-OD, 4130 tube. A 7/16"-thread tube adapter on the outboard end attaches a 3/8"-bore, high-misalignment, 4130, Teflon-lined rod end to be used as a tie-rod end. The strut steering arm is attached to the rod end with the provided hardware and bump-steer shims.